Researchers of the Microscopy department have developed a new methodology for the preparation of thin samples of concrete after gamma irradiation as part of the R4S (Research for SUSEN) project. 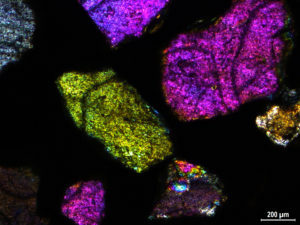 Basic evaluation of the microstructure of transparent samples with a thickness of the order of tens of micrometers is performed on a light microscope in the passing light. Detailed microstructural and chemical changes between filler and concrete binder are then evaluated by electron microscopy methods. In order to increase the accuracy of analyses, the selected points are mapped on the samples in the initial state and the identical points are then analysed after exposure to gamma radiation. Microscopic analysis of samples helps to explain changes in mechanical properties of concrete after tests performed in non-destructive testing laboratories in Pilsen.